Pre-engineered buildings offer cost effective ways to design energy efficient construction. Our sales staff can develop many types of "Energy Star Rated" commercial buildings: from gymnasiums to office buildings to power washable, USDA finished walls. 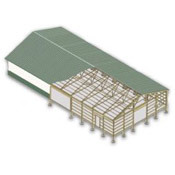 Choose from Solid Core or Post Frame Construction, EPS manufactures the building: trusses, floors, walls, columns, headers and complete structures. Our engineers can provide your the comfort of a fully guaranteed structure. It’s easy to see why Rutten Structures has become a respected leader in the fast and efficient construction of equestrian buildings.Our advanced panels provide exceptional insulation, long life durability and economical construction.At Rutten Structures we can help you create any combination of modules to provide quality, easy to maintain stalls, truck and trailer storage, riding arena and even an upscale office area. • Roof Trusses are pre-engineered, designed and certified to accommodate either commercial or agricultural snow loads for your specific requests. • State-of-the-Art Design eliminates knee braces and allows maximum use of space. • Fully Engineered- Designed in accordance with requested load requirements. Stamped drawings available. • Winter Construction- Post foundations can be easily embedded during winter weather. • Economical - Significant savings in construction time and material make EPS post frame building systems the most economical type of construction available in the United States. Structural Insulated Panels (S.I.P.S.) 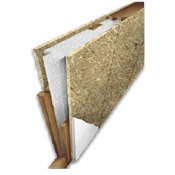 join high performance rigid foam insulation to Oriented Strand Board (OSB) or plywood. The thickness of foam are adjusted to increase R-Value. As labor sources become more scarce and costs increase in the future, building with Structural Insulated Panels will become the preferred building system. Exterior and interior facings are shown with standard OSB. CCX plywood is used when laminating aluminum, steel or FRP. Drywall is field applied as needed. The first Solid Core type construction was made in 1935 and the buildings are still in use today, nearly 70 years later. Click Here for more on S.I.P.S. Panelized construction gives you more building per dollar and more life per building!Your Rutten Structures building is designed for fast, simple erection and fabricated with the most efficient state-of-the-art equipment.You pay less for labor at the construction site. This means that more of your dollar buys you what counts – a quality building that will serve you profitably year after year.